Water Safety for Dog Paddling Dogs | Woof Report | The best email newsletter for dog lovers. Not all dogs like the water and know how to dog paddle. Educate yourself and keep your furry loved ones safe around water with our water safety tips for dogs. No one will dispute it. All dogs will bark, run and steal unattended treats from the countertops when the opportunities present themselves. But contrary to popular belief, all dogs cannot swim. True, some breeds like Labs, Setters and Spaniels might rather swim than eat, but for just as many other breeds, either swimming doesn’t come instinctively or they can’t pull off the doggie paddle in a pinch. Most fuzzy landlubbers like Bulldogs, Greyhounds, Dachshunds, Pugs, Corgis, Basset Hounds, and Scottish and Boston Terriers would rather lounge poolside than get their hair wet. While not all dog breeds are meant for serious swimming, they can still enjoy the water. Splashing around in a kiddie pool is just right for smaller dogs, older ones or any hot dog on a summer day. Pick one up for a pooch pool party right in your backyard. For pups who can paddle, follow along with water safety tips below. 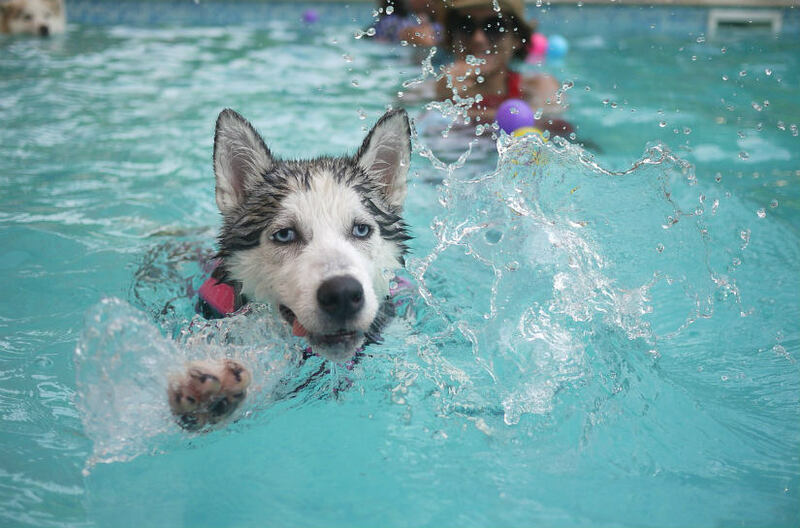 Ease your dog into swimming slowly to keep the experience positive and fun for your pup. Never throw your dog in the water or force him to swim. Until your doggie feels comfortable paddling on his own, support his midsection and hindquarters whenever he’s in the water. Suit up your pup in a well-fitting canine flotation jacket to help boost his swimming confidence and keep him safe in or around water. Amazon has a great selection of dog water vests, like those from Outward Hound. Some dogs will swim so far out in the ocean or lake that they get too tired to swim back. If your dog doesn’t listen when you call him back to the shore, don’t risk it. Keep him close to shore or let him swim on a long lead so you can always bring him back safely. Most importantly, watch your dog closely while he’s in the water at all times and look for signs that he’s had enough. If you have your own pool, be sure it’s fenced and off-limits to dogs or kids without an adult present. Then train your dog how to use the pool stairs to get out of the water and better yet, add a scamper ramp for easy exits. 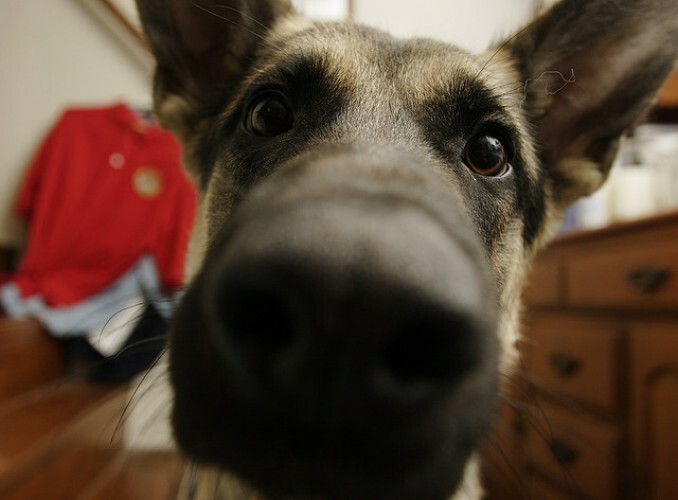 For extra safety, consider adding a safety monitor that sounds whenever a dog or child falls in. Not every dog-friendly swimming hole is safe for dogs. From strong tides and currents in the ocean to toxic blue-green algae in ponds and lakes, to underwater hazards, it’s important to consider the water conditions before your dog dives in. Clean and dry out your dog’s ears after swimming to avoid ear infections, and wash off your dog’s fur with fresh water after a dip. Prevent your dog from drinking sea and pool water by having lots of fresh drinking water on hand. For more tips on teaching your dog how to swim and water safety know-how, check out the article below. 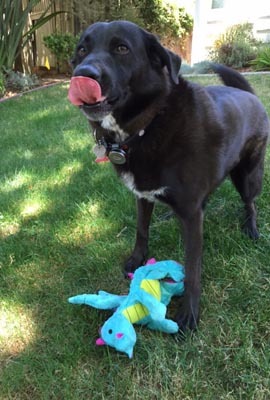 With the July 4th around the corner, read up on holiday pet safety tips. Originally published June 2010; reviewed and updated June 2017.